Pension " Saraj " is placed in small town named Kulen Vakuf on river Una, 46 kilometres away from center of north - west Bosnia & Herzegovina, city of Bihac. It is owned by Handzic family, Ismeta and Besim. 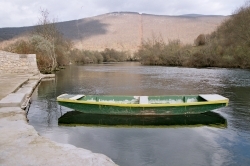 Pension is situated in a natural ambience, on a very riverside of the Una, the most beautiful river in the world. Area that pension "Saraj" encopasses is 2500 m2, which includes pension, parking lot and garage. Pension is 100 meters away from riverside of Una, surrounded with green area, which gives a look of real oasis. As a part of the pension, there are modern and fashionably equipped rooms with 20 beds so as 2 apartments. Also, within pension, there is kitchen and restaurant where you can try traditional Bosnian specialties. We dispose of our own beach on Una so as sport terrain, trim runway with possibility of driving bicycle. Our guests are people from every part of the world. Many of them are our usual guests, that come back every year at the same place to enjoy again in what Pension "Saraj" can offer, so as it's environment. You can reach Pension "Saraj" from Bihac by the Put 5. korpusa street, which leads to the inland of Bosnia & Herzegovina (Sarajevo, Zenica...). In place named Dubovsko, road detaches and leads to tame places like Cukovi, Orasac, and then you are entering Kulen Vakuf, where we are situated.